Mouse anti Human PCDH7 OTI3B7. 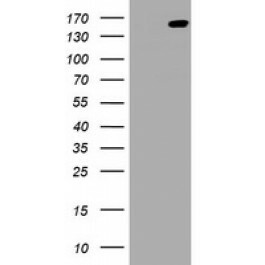 Full length human recombinant protein of human PCDH7(NP_115833) produced in HEK293T cell. This gene belongs to the protocadherin gene family, a subfamily of the cadherin superfamily. The gene encodes a protein with an extracellular domain containing 7 cadherin repeats. The gene product is an integral membrane protein that is thought to function in cell-cell recognition and adhesion. Altertive splicing yields isoforms with unique cytoplasmic tails. [provided by RefSeq, Jul 2008].